Stories and helpful advice for elementary teachers. Many of us make New Year’s Resolutions in January. By February, some of those resolutions are beginning to wane. The difference between keeping and forgetting a resolution can often be traced to the amount of feedback we receive on our goal. Whether it be the number on the scale, a count of books read, or the steps taken on our fitness app, timely and meaningful feedback helps all of us stay on track. Writing and speaking in complete sentences is a classroom expectation. Including a reason or detail within that sentence is part of our daily routine. Imagine my chagrin when a student once asked me if that rule included me. Was I expected to write in complete sentences when I commented on their work, including a reason to justify my comment? Not soon after, I received an appreciation note from a parent. The parent expressed specific examples of why their student enjoyed being part of our classroom community. The note meant so much more than a card that stated I was the world’s greatest teacher! 4. Feedback should be given Gently—Know your students. Feedback must be given knowing the receiver. Choose words you would appreciate receiving if someone was giving you feedback. Feedback is essential for everyone. The growth you will see in your students is well worth the effort! Opinion Writing - More than just "Favorites"
We begin to teach students the writing process through the genre of opinion writing, using prompts such as the one above. Through the use of opinion writing, students learn the writing process – gathering ideas, planning, and writing a rough draft. Prompts which focus on opinion writing provide students the advantage of knowing the topic. They do not need to gather information about the content of their writing, as opinion writing can focus on personal preferences or favorites. However, we do not want to stay with these limited topics. Opinion writing is so much more than simply writing about a favorite restaurant or TV show. How can we expand this writing genre to include both curricular areas and responding to texts? You have been invited to participate in a two-year space mission. During that time, you will travel throughout space without returning to earth. Write an essay explaining whether or not you would choose to take part in the mission. Include three reasons why you would accept the position or three reasons why you would decline the invitation. After completing our unit on space, think about what you have learned about each planet. Choose the planet you find most interesting and write a letter to a friend describing what they would see if they were to visit this planet. Make sure you use evidence from the texts to support your response. The Third Grade just completed our first field trip to the City Council as part of our unit on local government. Would you recommend that next year’s teachers take their students on the same field trip? Write an essay which explains your thoughts on the field trip. Include two reasons why you think the trip is valuable or two reasons why you would not recommend repeating the trip. Our first read-aloud this year was because of mr. terupt. I am deciding whether or not to begin next year reading the same novel aloud. Do you think this is a good choice to begin the year? Write an essay explaining whether or not you believe this is a good selection for next year. Include two reasons to support your opinion. As 6th graders, the freedoms and choices you have at school are increasing. Write an essay explaining to your teacher two choices you would like to be able to make in your classroom. Be sure to give reasons to support your choices. Although many primary students are not yet planning, teachers can still introduce the concept of prompts and planning to young students. As you experience concepts with students, be thinking of ways to introduce students to planning. 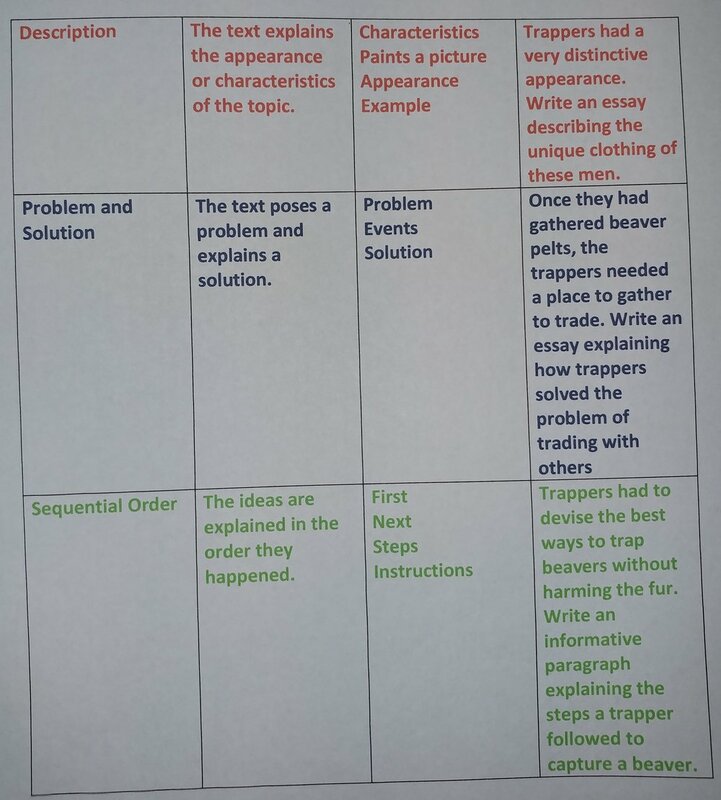 Create a chart with students, listing the topic and big ideas on the left side. Fill the t-chart in together, adding details to the right side of the chart. We have been working and learning all semester. We will celebrate our accomplishments with a party. 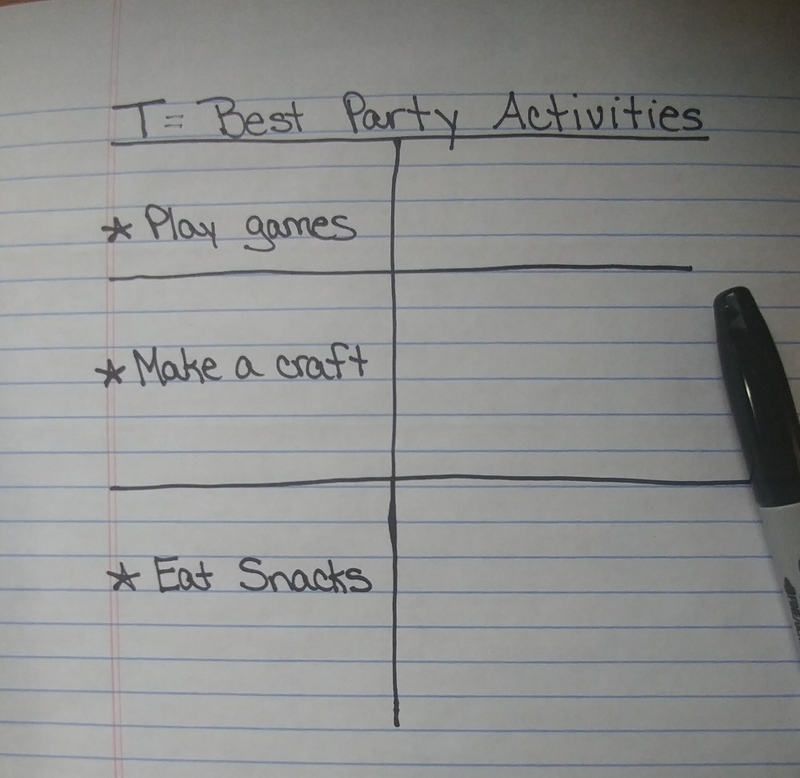 Think about activities you enjoy participating in at a party. What three activities do you believe we should definitely include at our celebration? We have been learning about people who help our community. We can invite one community helper to visit our classroom. Using the information we have learned, think about whether you would like to learn more about firefighters or police officers. Together, we will make two t-charts. The first chart will list three reasons you would like to invite a firefighter to visit our classroom and the second chart will list three reasons you would like to invite a police officer. We have been learning about three different habitats: the ocean, the jungle, and the desert. As a table group, choose one habitat you would like to visit. Using what you have learned, think of reasons why this habitat is unique and interesting. Together we will make a chart organizing reasons why people might travel to each habitat. We have been learning about habitats. We have just completed a book on jaguars. Using what you have learned, which habitat do you believe would be the best place for a jaguar to live? Give reasons to support your answer. Students are now ready to write an opinion paragraph in response to text. The skills needed to write the paragraph are the same, but students will need instruction on using those skills in forming an opinion in response to text. 1.) Choose a topic which relates to either content area curriculum or a shared classroom experience. Write a prompt which clearly addresses the topic and format you want students to use. Read the article on recycling. Write an opinion paragraph stating whether or not you think recycling should be mandatory in our city. Be sure to include three reasons that support your opinion using information from the text. 2.) Choose a text which is easily accessible to the majority of your class. Provide students with text which is easy to comprehend. The focus for this lesson should be learning how to respond to text, not how to read a difficult text. Instruct students in specific note-taking skills. If students are being asked to respond to a text, they need strategies for locating the required information. Students need to know that the skills they learned and used for writing an opinion paragraph are the same skills they use to write an opinion paragraph in response to text. Their opinion will be based on the information they have read in the text. The teacher will model taking the information found in the text and placing it in a t-chart plan. As you write the first paragraph together as a class, encourage students to share their writing as they complete each step of the writing process. This helps ensure the students are on the correct path. Opinion writing can be so much more than writing about “favorites.” Continually look for opportunities to encourage students to express their opinions in writing. We love to talk writing with teachers. Please let us know if we can be of service to you in any way. In the last few weeks, I have had two “away from school” interactions regarding the concept of assessments. The first experience came while visiting a new gym. Prior to taking the complimentary class, I was asked to fill out a goal and health assessment. The instructor said the information would be used to help me plan an appropriate exercise program and chart my progress as I attend classes. A few days later I was with my 13-month old granddaughter at an ophthalmology appointment. After performing multiple tests, the doctor determined she needed glasses to strengthen one of her eyes. While making a two-month follow-up appointment, the doctor told us that we would check her progress based on the initial tests he had performed that day. · Is a baseline, or beginning of the year, writing assessment a requirement at your school? · Do you have a reason or plan for using the assessment results? · Can you give the assessment in a reasonable amount of time? The answers to these questions will help you answer the assessment question. The following are some tips to make a beginning of the year writing assessment positive for both you and your students. Why are you giving the assessment? Keep this purpose in mind through-out the process. A Note to Kindergarten Teachers: You may choose to do the initial assessment when you believe your students are ready to begin writing instruction. Consider when the purpose of the assessment will be most appropriate. This is especially important if you are working with a grade level team. Prior to giving the assessment, choose a prompt for all students to follow, along with the time constraints provided. Use or develop a standardized grade-level rubric. Do you want students to write an expository or narrative piece? We recommend providing an opinion prompt on a topic which students already know. In this way, you will be able to assess students’ writing, not their knowledge on a subject area. Include in the directions the number of big ideas or details students should provide in their writing. Teachers give pre-assessments as an indication of skills students already possess. In a writing assessment, it is not necessary for every student to complete the writing task. When time is up, simply collect students’ writing. It is helpful to note both students who rush to completion and those who will require extra time. Do you have students who immediately break their pencil or go to the bathroom as soon you mention writing? Are there students who stare into space the entire writing time, “thinking about what to write about?” Do you have students who need constant feedback and reinforcement during the writing time? We recommend first reading each paper and then putting students’ initial writing samples in piles – Good Writing, Writing in Progress, and Need Extensive Help, or whatever category works for you. As you read students’ work, put the papers in one of these three piles. Remember, you are assessing writing using end of year writing standards. As these beginning of the year assessments are not used for a grade, this generalized assessment protocol will provide you with all the information you need. As you read students’ writing, do any patterns become evident? Do students use a similar plan? Are conventions an area of strength or concern? Are students excited or reluctant to write? Is student writing organized, did students stay on topic, etc? We all need to see progress. Keep these initial writing samples to show students later in the year. We recommend showing them to students prior to a midyear writing assessment. It is encouraging for students to see where they have been and how far they have come as writers. Teachers are busy people! Taking a moment to assess your assessments, making them relevant, useful and efficient is time well spent. Does Any Topic Sentence Work? Using the prompts from our study of text structures, we began to experiment with different topic sentence types. I wanted the students to have a bank of topic sentences they could draw on when asked to write to a variety of informative writing prompts. As we experimented and wrote informational essays, we collected topic sentences which worked well with each type of text structure. Prompt: Both trappers and traders were involved with trapping beavers. Write an essay explaining two similarities between these people and two ways their lifestyles were different from one another. The trappers and traders who worked in the Colorado Territory had both similarities and differences in their lifestyles. When studying the trappers and traders of the early Colorado Territory, historians have found both similarities and differences between these two groups. The trappers and traders who traveled to the Colorado Territory have many similarities and differences. Prompt: Trappers came to the Colorado Territory in the early 1800’s. Write an informative essay explaining a positive and negative effect on the environment due to the arrival of the trappers. The trappers who came to the Colorado Territory had both a positive and negative impact on the natural environment. When the trappers arrived in the Colorado Territory, they had a positive and negative impact on the region’s environment. As historians study the history of Colorado, they have identified both the positive and negative effects on the environment caused by the arrival of the trappers. Prompt: Trappers had a very distinctive appearance. Write an essay describing the unique clothing of these men. Trappers were easy to identify by their distinctive clothing choices. If spotted on the trail, an early beaver trapper was easy to identify by his clothing and appearance. The requirements of living outdoors in rugged conditions led trappers to make many unique clothing choices. Prompt: Once trappers had gathered beaver pelts, they needed a place to gather to trade. 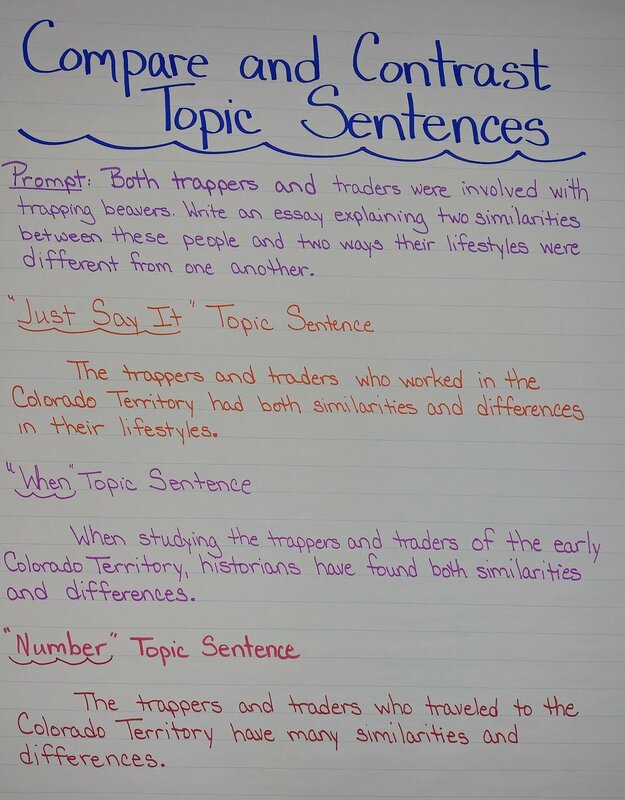 Write an essay explaining how trappers solved the problem of trading with others. Determining a way to trade with others was a problem faced by many trappers. As trappers gathered their bounty of beaver skins, they were faced with a problem. How could they sell their pelts and purchase items they needed for survival? When the beaver trapping season was completed, the trappers were faced with a dilemma. How could they now trade their pelts and purchase supplies? “Now that I have trapped these beavers and collected their pelts, how can I exchange this for needed money and supplies?” This was a question posed by many trappers at the end of the trapping season. Prompt: Trappers had to devise the best ways to trap beavers without harming the fur. Write an informative paragraph explaining the steps a trapper followed to capture a beaver. In order to trap a beaver, the mountain man had to follow specific steps. Three steps must be followed in order to successfully trap beavers. If a mountain man wanted to be a successful beaver trapper, then he must follow specific steps in the correct order. As men traveled to the Colorado Territory to trap beavers, they quickly learned the steps required to capture these animals. Through our work with informational text, we have discovered that some types of topic sentences work best with certain text structures. We have also learned a lot about the lives of the early trappers and traders! Our fourth-grade writers have gained another tool they can use when writing informational text to a variety of prompts. We have been transitioning from writing opinion to writing informative paragraphs. As we began our study of informational writing, it was a natural time to review the different types of text structures. A text structure is how the author chooses to organize the information in his/her writing. 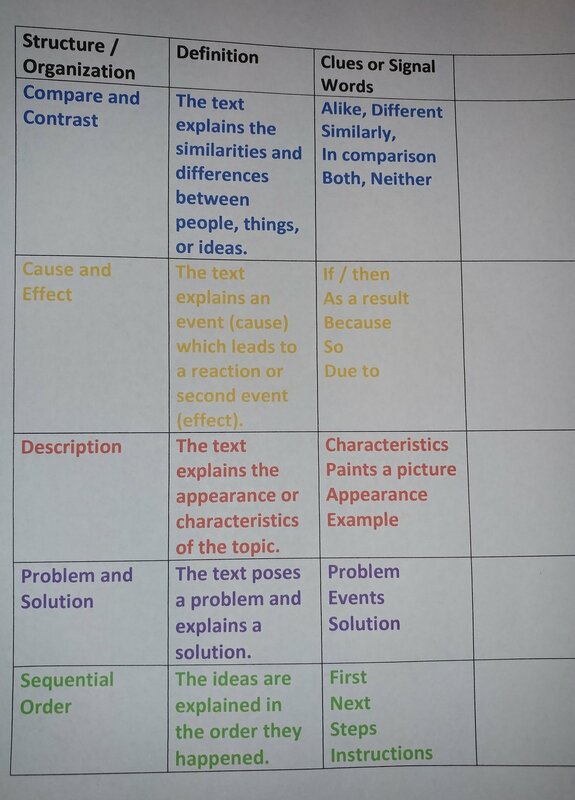 To help us better understand each text structure, we created the following chart as a class. We filled in the first three columns together. We listed the text structure, wrote a definition and then recorded signal words which would help us identify each text structure as we found it in text. The last column was left blank for future use. While reading informational text, we practiced identifying the text structure used by the author. Highlighting clue words and justifying our choice of structure helped solidify our learning. I now wanted students to stretch their thinking and practice writing informative text in a specific structure. To begin this process, we needed to identify what structure was being asked for in a prompt. The students were ready for the next step; reading a prompt and determining the text structure they would need to use in response. We returned to our chart. As we had been exploring trappers and traders in Social Studies, I chose that as the topic of the prompts the students would sort. To focus on the text structure required, I provided the students with five separate prompts. They now titled the final column in their chart Prompts. After reading each prompt, the students placed the prompt in the appropriate section on the chart. Students discussed their choices with partners, justifying their decision of which text structure to choose. When students reached an agreement, they glued the prompt in the appropriate row. The time spent on the chart proved invaluable. We were ready for the next step – making plans and writing topic sentences! For the first few weeks of school, we have been concentrating on the components of opinion paragraphs. My students have learned to gather and categorize ideas, organize plans and write opinion paragraphs which included all the essential parts. Now that students understood how to effectively write about their opinion, it was time to take the next step: writing opinion paragraphs in response to text. Students highlighted the format, topic and big ideas in their prompt. You have friends travelling to Colorado Springs on vacation. You are responsible for choosing one place to take your friends to show them the sights. To help make your decision, you will choose and research an attraction in Colorado Springs to visit. After making your choice, write an opinion essay explaining the attraction you have chosen to visit. You must include three reasons why this attraction is the best location to take your friends. The focus of this learning engagement was for students to write in response to text. With that in mind, I chose two websites for the students to use as research. The websites contained information about the local attractions using words and pictures. We discussed possible factors we might use when choosing a place to visit. Suggestions such as price, discounts, activities, food options, uniqueness to the area and being family friendly were all given. Students were assigned the websites through their google classroom accounts. After previewing the possible choices, we selected five attractions to focus on as a class. Students then selected the attraction in which they were most interested and researched the appropriate site. Wanting the information to be accessible to all students regardless of reading ability, I wanted students to share the information they had learned. I provided students chart paper labeled with each attraction. As a group, students discussed and recorded the information they had found concerning each place to visit. On the following day, students were asked to create their individual writing plans. Reviewing the prompt, we remembered that our writing required three big ideas. Using the chart paper, students looked for similar ideas to classify together. As they had spent time gathering and discussing ideas, the planning came easily. With completed plans in hand, the students eagerly began to write. Many chose to begin their paragraphs with an “Although” topic sentence, acknowledging that other activity choices would also be enjoyable. They easily incorporated information they had learned from the text, the goal of the lesson. The students’ engagement with their writing made it an appropriate piece to take all the way through publishing. With green and red pencils in hand, students edited their work, tracing all punctuation in red and all capitals in green. They typed their finished product, adding an image of the attraction to provide the reader with additional information. The transition to opinion writing based on text had gone seamlessly as we had the needed writing skills in place from previous lessons. The students had been interested in the topic, engaged in the research, and excited to edit their work and share it with each other! We had definitely been exploring and learning. Sometimes we all need a different perspective! 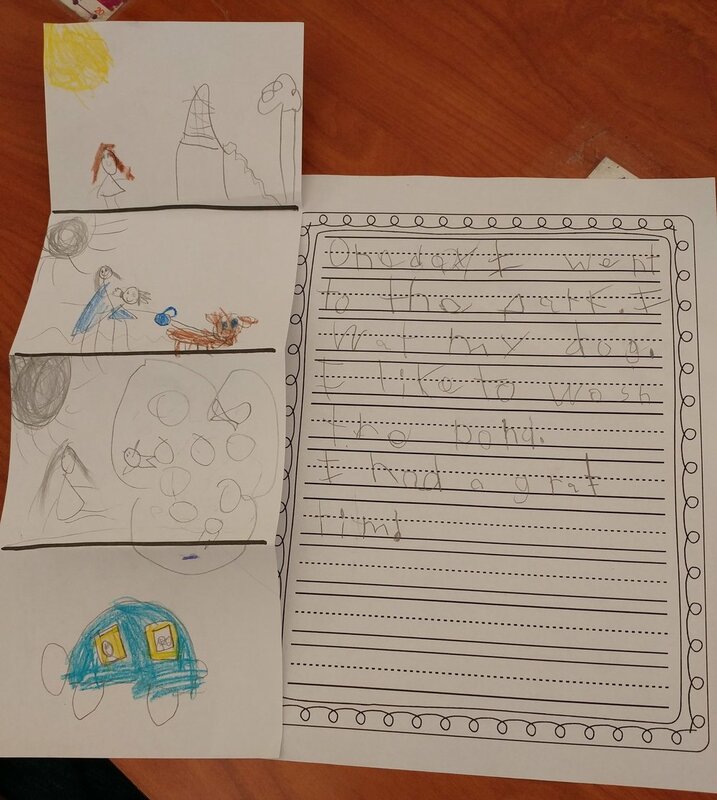 We had been working with kindergartners on writing a narrative. The students had drawn pictures prior to writing, illustrating the setting and 2 events that took place in that setting. They had written about their time in the library, an event on the playground, and a special time with their families. We now wanted to expand their writing to include a problem that the characters needed to solve. Along with a problem to solve, I wanted to provide students an opportunity to add details to their writing. I brought in sheets of paper cut in 4” by 18” strips for them to draw pictures onto to help plan their writing. I folded the strips into four rectangles and we were ready to start. Purely be accident, I taped the paper to the board vertically beside a piece of chart paper. With the paper hung vertically instead of horizontally, the order of the pictures matched the writing we would be doing on the paper. We decided to try a different perspective on writing. To model the process, I began writing a story about buying some apples in the grocery story. Before writing the story, I told the students we would sketch out the essential events. The first box was for my setting. I quickly sketched a picture of me standing in front of a display of red, juicy apples. This was where my story would take place. The next box was for the problem. As a group, we discussed the importance of the problem. Just putting the apples into a bag and putting the bag into my grocery cart did not make a very exciting story. What problem could I encounter? In the second box I drew a picture of me placing apples in a plastic bag. Unfortunately, there was a hole in the bottom of the bag and the apples were dropping out all over the floor. The third picture was where we would sketch the solution. The very kind grocery store worker had come and helped me gather up all the apples I had spilled. I drew a picture showing this solution. The final box was designated for the conclusion. The story could not just abruptly end, but needed to show how the character reacted to the events. What happened at the end of the story? How was the character feeling at the end of the story? In the final box of my paper, I sketched a picture of me happily leaving the store with a bag of apples in my hands. One day I went to the grocery store to buy some apples for my lunch. We folded the first square behind the second square, so our second picture was now on top. Students could easily see what we were writing about next. One day I went to the grocery store to buy some apples for my lunch. I opened a plastic bag to carry my apples. I didn’t know there was a hole in the bottom. As I put the apples in the bag, they all fell on the floor. We repeated the process for the third picture, folding the first two pictures back. The third picture was now on top. One day I went to the grocery store to buy some apples for my lunch. I opened a plastic bag to carry my apples. I didn’t know there was a hole in the bottom. As I put the apples in the bag, they all fell on the floor. I was about to cry. A kind man who worked at the store came and helped me collect all my apples. We are ready to conclude our story. We want to let our readers know how the characters are feeling at the end of the story. One day I went to the grocery store to buy some apples for my lunch. I opened a plastic bag to carry my apples. I didn’t know there was a hole in the bottom. As I put the apples in the bag, they all fell on the floor. I was about to cry. A kind man who worked at the story came and helped me collect all my apples. I paid for my apples and left the store feeling happy and ready for a snack. The students were ready to write on their own, with some support. To help guide their writing, we all chose the park for our original setting. Students drew a picture of the park in the first box. 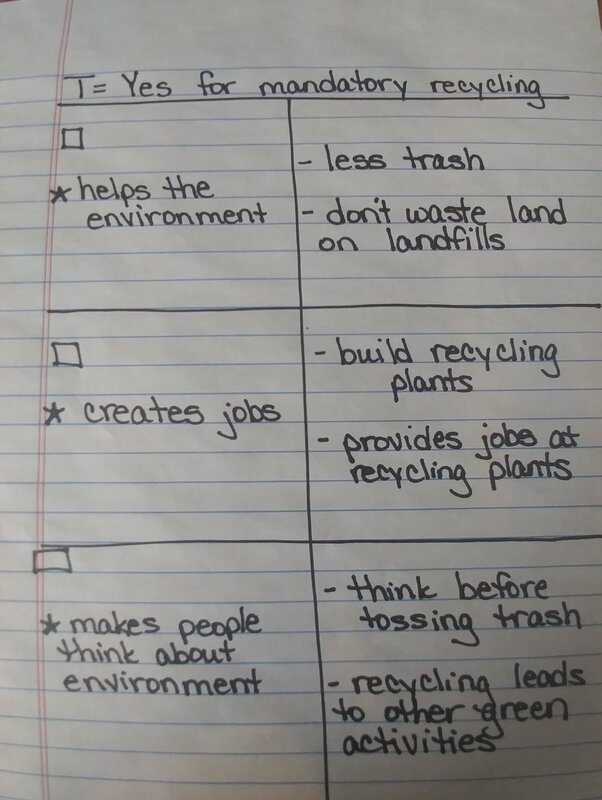 After brainstorming ideas, students drew a possible problem they might have in the park in the second box. The third box was used for drawing the solution and the final box showed how the characters felts at the end of the story. Although the students wrote independently, we followed the steps together. I was impressed how easily it was for them to fold the paper and write their story in order. They were able to write a story with a setting, problem, solution and conclusion. Accidentally hanging the paper incorrectly had been a successful mistake! Don’t you love spontaneous teachable moments? As a class, we were sharing spring poems and had read Bobbi Katz’s poem “Spring Is.” http://blog.lrei.org/ls-poetry-archive/spring-is-bobbi-katz/ The physical layout of the version we read made the reader feel as if they were running in their sneakers down the stairs. 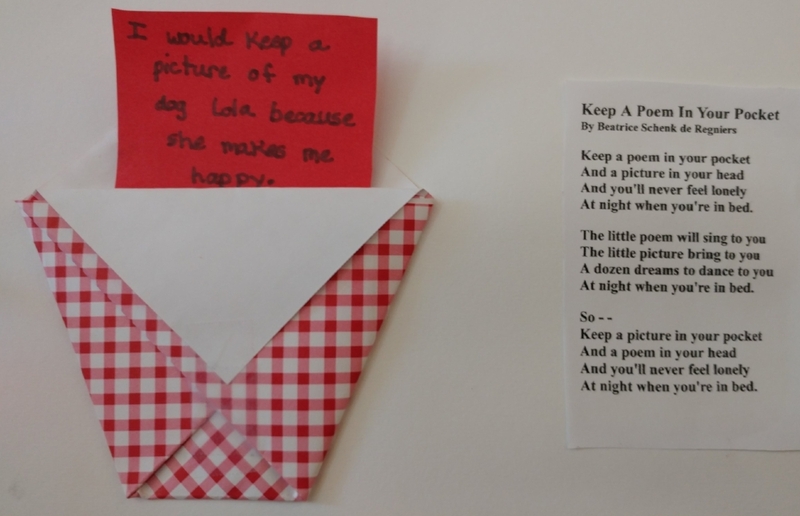 As we discussed how the words’ placement impacted the poem’s meaning, my students began to look for other examples of poems written in a shape. It was the perfect time to change the direction I had planned for the morning and introduce the concept of concrete poetry. A concrete, or shape poem is one whose meaning is told through both the words and its graphic shape on the page. To begin our exploration, I simply googled “image of concrete poems for children.” As the class viewed these images, students quickly ascertained that in a concrete poem a poet conveys his message in two ways, both through the text and through the shape in which he puts the words on paper. My bike wheels were spinning in circles like planets orbiting the sun. Wanting the students’ content to be just as significant as their drawing, I gathered some books with concrete poetry examples. The three we used for examples were Technically, It’s Not My Fault by Grandits, Meow Ruff by Sidman and Outside The Lines by Burg and Gibbon. All three authors write their concrete poems in unique ways. As we read the poems, students identified different ways the poems were put together. Some poems were written in the interior of a shape while in other poems the words were written so the words outlined the shape. We were ready to write. Two important decisions had to be made. Using their completed phrases, students first chose the format for their poetry. Like the poems we had studied, some chose to write in phrases, some students wrote following a rhyming pattern and others used complete sentences. The second decision was what shape would best convey the message. As I met with students, I was amazed by their creativity. The room was abuzz with excitement and engagement as students matched their poetic words to a shape. As a class, we had spent an amazing morning learning and creating together. Every class has its own personality. This is both a joy and a challenge of teaching. Organization and classroom management styles that work perfectly one year may prove ineffective the next year. I have been reminded of this truth during the current school year. To insure student engagement and success with this year’s students, I need to provide instruction which adds new skills in a heightened sequential manner. Definite strategies are needed to help students deepen their critical thinking skills. For the past week, we have been studying the prehistoric people of Colorado. My goal was for students to make the connection: As prehistoric people moved from hunter/gatherers to farmers, they had time to build homes and improve their lives. I knew that this required higher level thinking skills and that students would need to follow specific steps in order to reach this understanding. We began by setting up a chart where students could record their notes. The chart was divided into Dates, Homes, Food, Hunting/Farming and Additional Facts. As we studied each group of people, students completed the correct portion of the chart. The students had acquired knowledge about these groups of people, but I now wanted them to draw some conclusions from this history lesson. What could we learn from these people outside of the facts of their existence? Using chart paper, students drew pictures of the prehistoric people in chronological order. They illustrated the homes, food sources, weapons and tools used by each group of people. I was thrilled to watch students use ipads to discover ways to draw a kiva or an atlatl. Every student was engaged in drawing their chart and putting forth their best effort. We repeated the same process for food sources and weapons / tools. Now it was time for the point of the lesson. What conclusion could students draw on how each aspect of these people’s lives impacted other areas? I was thrilled as I listened to students draw this important connection! As a culminating activity, students were able to share their learning using a photo and voice recording program. (I gave my students a choice between Adobe Spark or Explain Everything.) As they had already given their conclusions deep thought and had written their responses, this final step was seamless and enjoyable! The point of this learning engagement was not only for students to learn about Colorado’s ancient people, but to also deepen their critical thinking skills. 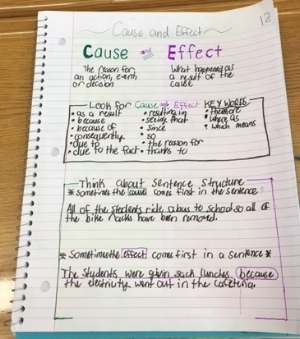 In addition to the content, the goal was for students to learn how to learn, to learn how to document their learning, and most importantly, how to draw a conclusion and share their thinking with others. Slowing down and going step by step had worked well for all of us.